Twice as many “Things” vs. People connected to the Internet today. 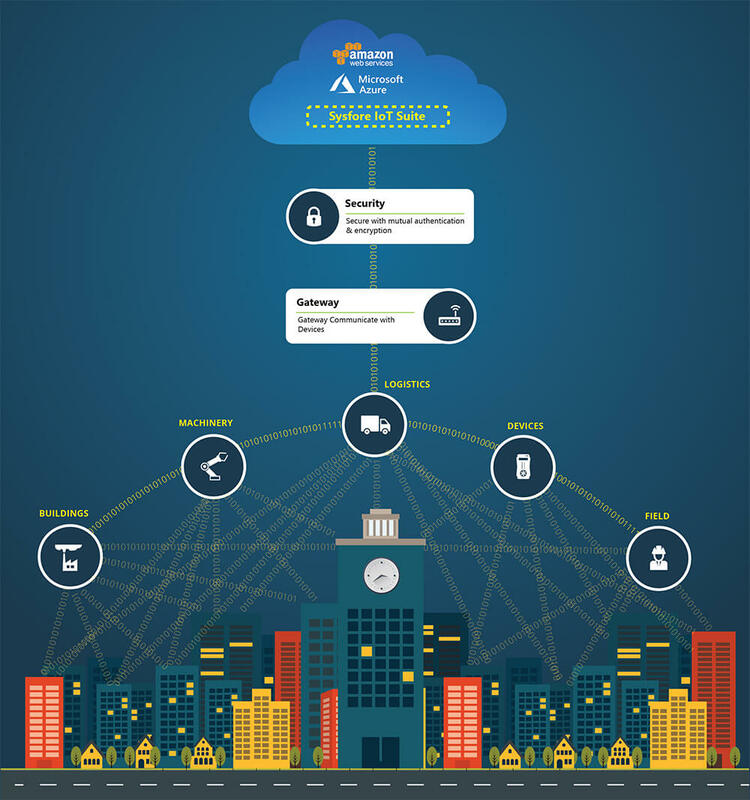 Sysfore IoT is a set of cloud managed tools that helps you to flawlessly develop and deploy IoT applications to the Azure or the AWS IoT suite. Sysfore being recognized as a Microsoft Azure Gold Certified Partner and Amazon Web Services Cloud Consulting Partner, we have demonstrated expertise and skills in helping customers’ worldwide transition to the Cloud. Our IoT Cloud services can support billions of devices and messages, processing and routing them to your cloud endpoints and to other devices reliably and securely. Our focus being on providing cost effective Cloud IoT solutions with round the clock customer support. Sysfore gives you access to Internet of Things development tools that helps your applications to keep track of and communicate with all your devices, all the time, even when they aren’t connected. At Sysfore we help companies integrate their IoT data into their existing mission-critical applications and processes and, more significantly, leverage their connected products and assets to create new innovative applications that transform your business. We provide a set of IoT tools and cloud-based services for Connecting, Managing and Building intelligent products, integrating the product data with back-end systems to build M2M and IoT applications for nearly every industry. Data is only ones and zeros until you turn it into insights and business impact. When you use the advanced Microsoft Azure IoT or AWS IoT Suites, data from your asset monitoring and data analytics allows you to enhance decision making and innovation. You can see the potential to transform your business by creating new business models, business processes and revenue streams through data insights that weren’t visible before. Get more out of your existing IT assets. You don’t need to rip out and replace your IT to begin to see value from IoT. You can start with your existing IT assets and build upon them using the Sysfore's Cloud IoT services. Add a few new devices, connect them to the IoT cloud platform and enable them to talk to each other, to your employees and to customers. Transform your business by utilizing the data those devices generate with business intelligence tools to gain deeper insight into what your customers and employees want and need. Enable small changes to make a big impact. The Internet of Your Things starts with identifying the one process, product line or location that matters most to you, then making small changes for big impact. For instance, connect robots on the factory floor with back-end systems and create a production line with a more continuo’s uptime or add expiration dates to the data set for pharmacy inventory and save thousands on wasted medicines. If you need help getting started with Azure or AWS IoT Suite, please fill out the form below and one of our specialists will follow-up with you shortly.